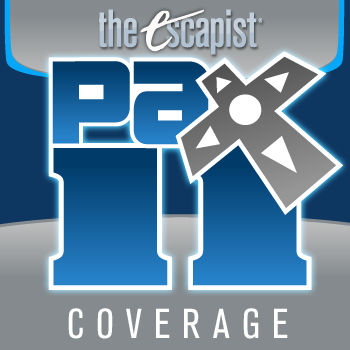 The Escapist crew has a lot going on at PAX this year! Ah, the Penny Arcade Expo. The three-day celebration draws nerds, geeks and dorks to the jewel of the northwest - Seattle, Washington - to revel in twenty-sided dice, DS Lites, and Jayne hats. I've been to Boston the last two years for PAX East but this will be the first time I've attended the Optimus Prime convention for all consumers of nerd culture. The Escapist is heading to Seattle with high expectations of what games and products we'll see in the expo hall, but we'll also be bringing a metric ton of programming with us. From insightful panels on gaming lifestyle, female gamers and the evolution of D&D to actual roleplaying and movie nights, there's opportunities to hang out with The Escapist denizens throughout the weekend of August 26-28th. If you're headed to PAX this year, you don't want to miss The Escapist movie night on Saturday night. Not only will you get to watch your favorite episodes of ZP and Escape to the Movies on the big screen, but we'll also be raffling off some great prizes provided by PopCap. The drawing starts at 9pm. Here's the full schedule of all the programming we'll be running at PAX. Keep in mind that some of this information is more accurate than what is posted on the PAX website. LoadingReadyRun, producers of Unskippable, CheckPoint, Feed Dump, ENN & Daily Drop, and organizers of the Desert Bus for Hope fundraiser, will delight and amaze you with new videos and answers to your questions! Come hang out! Join The Escapist's Games Editor, Greg Tito, as he guides players through a session of adventure and intrigue with his new tabletop roleplaying game. The six-hour sandbox session begins in a council of Kings as you debate how best to defend the Borderlands from an invasion of beastmen, and the decisions you make together will determine what exciting adventure is played out in detail. The Adventurer Conqueror King System (ACKS) fulfills the promise of the original fantasy role-playing game by providing comprehensive, integrated support for play across all levels of a campaign, from dungeon-delving to stronghold building and magical research. The game only has 12 slots but you can sign up ahead of time at Tabletop HeadQuarters (Room 204-WSCC). You don't have to stay for the whole game six hours, feel free to bow out so that other gamers and try their hand at ACKS. Special guests will be dropping by over the course of the session: who knows who'll you'll be throwing dice with? Also, you'll get a chance to win prizes and raffle tickets just by participating in the game. Meet the stars of The Escapist's Loading Ready Run, Unskippable and more at The Escapist's Movie Night. You'll see never-before-seen videos from The Escapist's most popular web series, including Zero Punctuation and The Big Picture. Plus see favorite episodes from Zero Punctuation, Unskippable, Feed Dump, The Big Picture, Miracle of Sound, Jimquisition, No Right Answer and more, hosted by Loading Ready Run and the staff of The Escapist. Movie night starts with a drawing of raffle tickets emblazoned with fantasy, sci-fi, and videogame characters instead of boring numbers. Prizes include merchandise provided by PopCap and The Escapist. Join Senior Editor Susan Arendt as she leads a discussion on what lady geeks embrace in female fictional characters and why these attributes are important. Panelists include Christa Carter, former Community Manager for Xbox Live and co-founder of Gamerchix; Kathleen de Vere, star of LoadingReadyRun; AJ Glasser of Inside Social Games; and Brittany Aubert of 5th Cell. They will identify their favorite characters and how they would like more heroines with similar attributes integrated into Geek culture. This fresh, positive approach to female characters shouldn't be missed. Join Dungeon & Dragons experts Keith Baker, Mike Mearls and Mike Selinker as they analyze and discuss the evolution of Dungeon & Dragons. The D&D game has changed over the years as it has grown from an underground phenomenon to one of the defining pillars of modern fantasy. Join us as we look at D&D through the lens of its rules. With each new edition, the game has changed and shifted to deliver the best fantasy gaming experience of its day. What changed, how has the game improved, and has it lost anything over the years? Moderated by Greg Tito, Games Editor of The Escapist. Flying in the face of criticism against videogames and their ruination of lives, this panel will address the topic of living a life made richer by playing games. From how to keep your job while supporting a game-playing habit, to making your game-playing habit your job. Graham Stark, Jeff Green, and Ian Dorsch will share secrets and personal stories, deflate hype and participate in a detailed Q&A. Moderated by Russ Pitts, Editor-in-Chief of The Escapist.